JACKSONVILLE, Fla. - Crews have been hard at work clearing the site of the implosion of old City Hall implosion and the demolition of the old Duval County Courthouse. Instead of sending all the rubble to a landfill, much of it will be recycled and reused in other projects around the city. Several days after Sunday's implosion of old City Hall, debris standing several stories high still remained downtown. News4Jax was told just about everything left behind from the building will be recycled, aside from any wood or plastic. Thousands watched Sunday morning when the dynamite went off and the old 15-floor riverfront building crumbled to the ground. The cleanup process has been underway this week, with a steady flow of trucks coming to the job site every day and leaving loaded with chunks of debris. On Thursday, News4Jax visited a local crushing yard facility where everything gets sorted out. There were mounds of broken-down brick, concrete and asphalt from the downtown project -- ready to be reused. Between the old courthouse demolition and old City Hall implosion, around 70,000 tons of material will be recycled by United Brothers Development. "We will be taking all of the brick, tile and concrete from that job and recycling it to be used back into the city," said Lance Dostie, concrete division manager for United Brothers Development. Over time, pieces of the old City Hall and the old courthouse will become part of local roads, parking lots and even driveways. "A lot of the brick paver driveways you see in Jacksonville actually come from recycled concrete, so you might have a driveway that has some of the football stadium, some of the JaxPort, and, now, some of the courthouse in it," Dostie said. 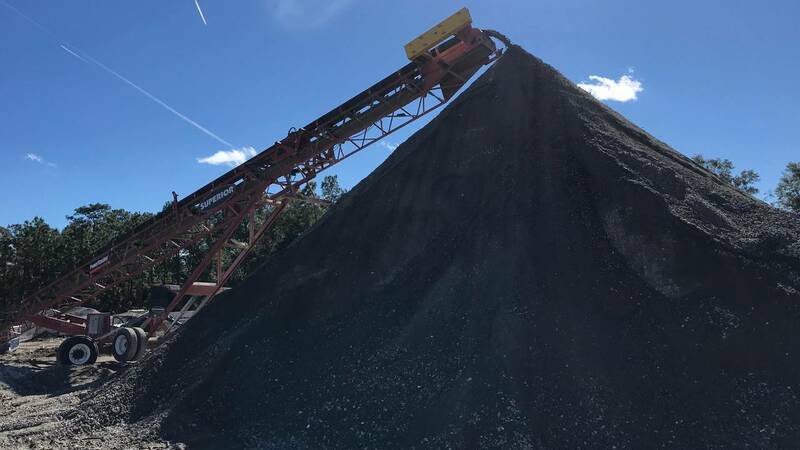 According to United Brothers Development, recycling concrete saves a tremendous amount of space at local landfills and, ultimately, protects the environment by preventing the expansion of lime rock mines throughout the state. United Brothers Development told News4Jax a project of this size will take a couple of months to fully clear. Once it’s complete, it will be filling the site up with dirt to bring the ground back to a normal level.